"In excellent voice, Victor Sgarbi relishing his role as his character's passions raise." 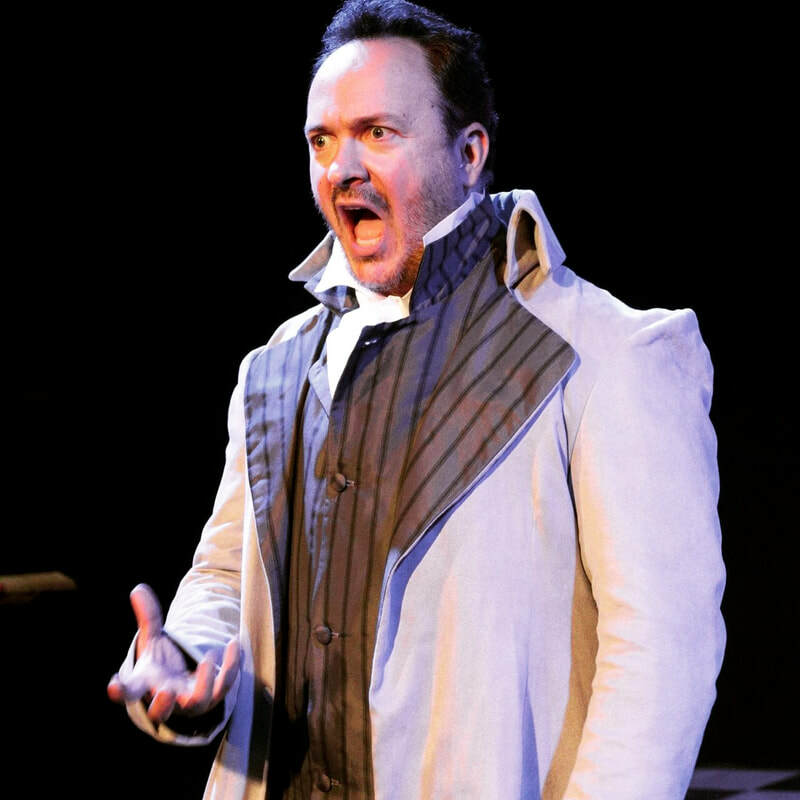 (Germont) - King's Head Theatre - La Traviata - British Theatre - Oct/18. "...sang a captivatingly fresh and sweet Zerlina while the charm of Victor Sgarbi as the permanently amorous Giovanni won sympathy against the odds. "...canny performance that effortlessly matched up to Brazilian Victor Sgarbi’s swaggering, manoeuvring and utterly ruthless Don. Sgarbi too has a voice well worth hearing: rich in tone, lucidly enunciated, and catching the overriding cynicism of this Spanish rake aptly and cleverly. He strutted to good effect, quite incapable of seeing the fiery doom his grotesque activities will land him in. Giovanni’s and Leporello’s exchange of recitative was just one of many fine quick-fire battering..." Roderic Dunnett, 25/06/2016 , for Don Giovanni, Oxford. "But it’s after the interval that the heart of the show really shines: Tony Harris, as himself, interviews our two singers (lyrical Brazilian baritone Victor Sgarbi, and Purley-born tenor Daniel Joy) as themselves, talking about how they became an opera singer, and taking audience questions. Here Sgarbi and Joy still sing a couple of arias each, chosen personally from their own repertoire, while telling their stories with self-effacing openness. The myriad paths to opera – Sgarbi started out as a successful dentist and maxillofacial surgeon in Brazil, before selling everything he had to go to music college – are humbling and fascinating. As an audience member, it’s all too easy to forget the level of skill, struggle and dedication needed to succeed in the super-competitive, thoroughly unlucrative world of opera.."
"Victor Sgarbi as a charming Escamillo gives us a matador with a bold baritone presence" Mary Nguyen, LDN Card, 7/7/2014. "Opera singers to look out for." (in regards to Salieri, First the Music then the words)Peter Woolf , for Musical Pointers on 28/08/11. "Restraint and a truly well placed baritone voice were a major contribution from Victor Sgarbi the Turk of the title." Barry Grantham. 7/2009. "In ’16 Bars’ Julia Buckley and Victor Sgarbi duet together and I must say harmonise well". Tremayne Potter, UK Theatre Magazine, 11/7/2009. "In 'Can We Go Dancing?’, ‘My Heart Bleeds’ and ‘Do You Remember? one could compare the vocals of Victor Sgarbi to that of Jonathan Pryce" Tremayne Potter, UK Theatre Magazine 11/07/2009. In continuation of his policy to introduce the rich culture of Brazil to the residents of the capital and if possible, to people living in other parts of the country, Ambassador Alfredo Leoni hosted a performance by two of Brazil’s well known artistes, pianist Ivan Pires and baritone Victor Sgarbi. Addressing the gathering the host thanked the artistes for accepting his invitation to perform in Islamabad as well as his deputy, Joao Belloc, who had arranged the whole affair in his absence. With a brief introduction of the artistes, he concluded by hoping his guests would enjoy the performance. Ivan Pires began studying piano at the age ten and acquired a Bachelors Degree in Piano from the School of Music of Arts of the State of Parana, Brazil. He has performed at several renowned theatres and concert halls in Brazil and has held recitals in France, Portugal, Italy and the UK. In 2005 the ‘Year of Brazil in France’, he performed to great acclaim works by Brazilian composer, Heitor Villa-Lobos at the ‘Casa do Brasil’ in Paris. He has recently made his first recording at the church of ‘St. Martin-in-the Fields’ in London where he now lives."